Lamar University's Department of Theatre and Dance will perform two one-act plays from different periods of the career of Nobel prize-winning British dramatist Harold Pinter, Feb. 9-12, in the Studio Theatre. In The Dumb Waiter, written in 1957, two hitmen, Gus and Ben, anxiously await their next assignment in a nondescript basement room. "The Dumb Waiter might be considered the best of Harold Pinter's early plays. . . . It combines the classic characteristics of early Pinter - a paucity of information and an atmosphere of menace, working-class small-talk in a claustrophobic setting - with an oblique but palpable political edge and, in so doing, can be seen as containing the germ of Pinter's entire dramatic oeuvre," wrote Harry Derbyshire in Modern Drama. A Kind of Alaska, written in 1982, tells the story of Deborah, who suffered from encephalitis lethargica, or "sleepy sickness," and has been in a comatose state for 30 years. With the mind of 16-year old, she must confront a body that has aged without her consent. The play was inspired by the book Awakenings by Oliver Sacks, which documented the encephalitis epidemic that plagued Europe in the early 20th century before L-DOPA was invented. "Pinter is a great playwright whose work doesn't get staged enough; he's rarely taken on anywhere in America, and even more rarely on college campuses in the region," said director Joel Grothe, associate professor of theatre. "I try to choose work no one else in the region is doing. 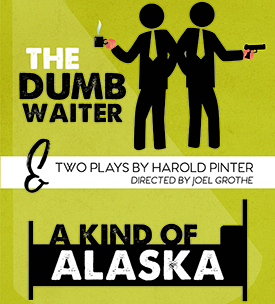 Also, I thought these two plays were a good fit for our audience and our student actors. They capture the Pinteresque style but are also fairly accessible to both actor and audience." The cast of The Dumb Waiter features Sydney Haygood of Friendswood as Ben, and Austin Jones, Houston, as Gus. Iza Scott, Beaumont, plays Deborah in A Kind of Alaska, while Maddy Hightower, Port Neches, performs as Pauline. Michael Saar, LU reference librarian and associate professor, rounds out the cast of A Kind of Alaska as Pauline's husband, Hornby. Tickets may be purchased in person at the box office, open Monday, Feb. 6 through Friday, Feb. 10, from 2:30-4:30 p.m. and one hour before each performance. Tickets may also be reserved over the phone at (409) 880-2250. The box office accepts cash, checks, and all major credit/debit cards.